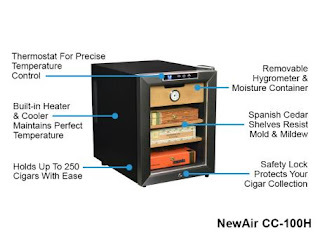 I have been looking for a high end humidor that I could afford and NewAir has the most amazing prices for the best products. I consider myself somewhat of an aficionado and love smaoking and sharing cigars with my signaficant other and friends especially on special occassions. This humidor is for in my opinion the serious cigar connoisseur or the special occassion smoker. The price makes it affordable to the special occassion smoker as an amazing way to store and shocase their cigars for a great price. 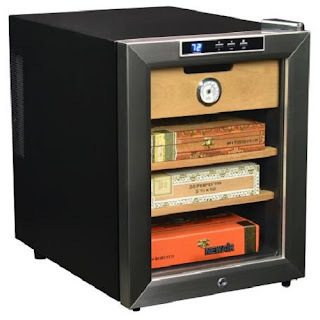 The serious smoker can afford this homidor and it is good enough for the serious collector. The hygrometer is very accurate and this humidor can store up to 250 cigars. This amount of storage space is appealling to any serious collector. The Spanish cedar trays resist mold and mildew and create a perfect decor for the price making it perfect to tie into your home decor. I love the sleek design it fits right in with our room decor. I loved how easy this humidor was to set up. It took less than a day to get it ready which is great for my busy life. My only tip would be watch your humidity level as this humidor holds humidity extremely well. 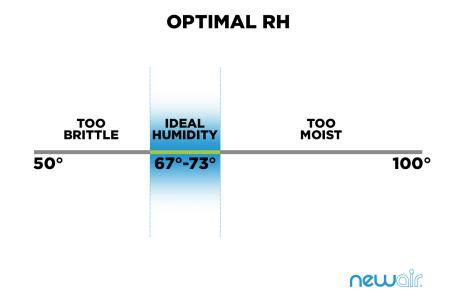 The images below show you a bit more about what to look for in your humidity level. I prefer 72 degrees but 70 is the reccomended humidity. Also below is a labeled guide to help with different parts of the humidor for set up. The guages are all easy to see and read and the touchtone dial makes changing temperature simple with the touch of a button. The lock and key is great for keeping out cigar thieving buddies. I always end up missing a few when family come now atleast they will have to ask.highly reccomend this humidor.